July 2, 2018. New Delhi, India – To start the day, His Holiness the Dalai Lama gave an interview to Adriaan van Dis for Dutch television in connection with his prospective visit to the Netherlands in September. Van Dis opened by asking if His Holiness is ever angry and he told him that occasionally he is, but it doesn’t last. They talked about other people who may be angry and the gap between rich and poor. His Holiness remarked that historically the wealthy upper classes have exploited the poor, who, even when they enjoy equal rights, find it difficult to build self-confidence. Van Dis mentioned the anger expressed by young Tibetan writers he’s read. His Holiness explained that Tibet is not only physically occupied, but also that hardliners among Chinese officials view any distinguishing Tibetan quality, such as Tibetan culture and language, as an expression of separatism. Consequently, study of Buddhism and Tibetan is restricted. The conversation turned to scientific interest in the mind and the brain. In connection with his own reincarnation His Holiness conceded that there have been no recognised reincarnations of the Buddha or Nagarjuna. He suggested that in some cases the system is enmeshed in feudal practices in which a Lama’s attendants are more concerned with their continuing to enjoy his property and privilege. He reiterated that as early as 1969 he made it clear that whether or not there is a 15th Dalai Lama will depend on the Tibetan people. He noted that there will be a meeting of Tibetan religious leaders to discuss the question again towards the end of the year. He pointed out that one option that has been followed in some cases is for a candidate for successor to be nominated before the predecessor has died. His Holiness also expressed approval of the way a Pope is elected from among qualified individuals. Recommending how to create a better world, His Holiness declared that a key factor was a more general recognition of the oneness of humanity—understanding that the 7 billion human beings alive today really are brothers and sisters. A short drive across South Delhi brought His Holiness to the Tyagaraj Stadium where more than 5000 principals and teachers from Delhi’s public schools awaited the launch of a newly configured ‘Happiness Curriculum’. He was welcomed by Deputy Chief Minister Manish Sisodia and escorted into the building, where they were soon joined by Chief Minister Arvind Kejriwal. Warm applause greeted all of them when they entered the hall and took to the stage. Once brief introductions had been made, His Holiness and his hosts were requested to light a traditional lamp indicative of the way the light of wisdom overcomes the darkness of ignorance. A group of music teachers sang a welcome song they had composed themselves and students presented potted plants to each of the dignitaries. In his address, Mr Sisodia thanked His Holiness for the inspiration to draw up the ‘Happiness Curriculum’. He said that after improving infrastructure and curtailing the clerical work expected of teachers, he and his colleagues had wanted to ensure better education by helping students to be happier. He cited His Holiness’s advice that India is uniquely placed to combine modern education with ancient knowledge of how to tackle negative emotions. The new ‘Happiness Curriculum’ will involve periods of meditation, mindfulness and training in universal human values. He told His Holiness that teachers were excited to be able to listen to what he had to say. He mentioned one teacher who today decided to come to listen to him rather than sit an exam required for promotion. Chief Minister Arvind Kejriwal criticized the system of education left by the British as just preparation for the passing of exams. He said that what he wanted to do was to educate students so they would be capable of taking the country forward. On that basis, he added, the Delhi Government has doubled the education budget. He described the new curriculum as a firm step towards shaping better, happier human beings with improved values. 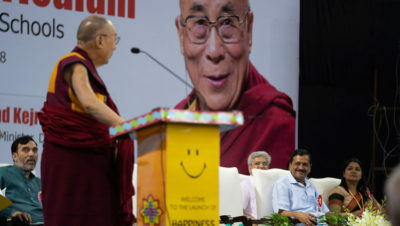 Mr Kejriwal declared that there was no better person to inaugurate the ‘Happiness Curriculum’ than His Holiness the Dalai Lama. He thanked him personally for accepting the Delhi Government’s invitation. He, Sisodia and His Holiness each unwrapped a packet given to them and formally released the books related to the project. Objectives of the new program include developing self-awareness and mindfulness in students; inculcating critical thinking; enhancing communications skills; encouraging greater empathy with others; helping students learn to deal with stress; and developing a greater sense of social awareness and human values. In response to requests to speak, His Holiness approached the podium and began by greeting all present. “My dear respected friends the Delhi Chief Minister and his Deputy, elder brothers and sisters, as well as younger brothers and sisters, I feel this is a really meaningful occasion. I appreciate the efforts you have made and I am truly honoured that you invited me to come today. I’m convinced that it is possible to combine what’s good in modern education with ancient Indian knowledge. “I myself am a student of ancient Indian thought. In the 8th century, despite longstanding relations with the Chinese, the Tibetan Emperor chose to develop Tibetan writing on the basis of the Indian Devanagari script. He also chose to invite qualified teachers of Buddhism from India—Shantarakshita, a pure monk, a great scholar, a philosopher and logician and his student Kamalashila came from Nalanda and established Buddhism in Tibet. These masters’ approach to study was characterized by scepticism and the use of reason. It’s a system involving 30 years of study. “I learned to study this way too and, although I was lazy and reluctant when I was young, later I came to appreciate how useful it is. One Tibetan scholar mentioned that although it was known as the Land of Snow, until the light of knowledge came from India, Tibet was dark. “We Tibetans think of ourselves not only as chelas or disciples of Indian gurus, but as reliable chelas because we have kept what we learned alive for more than 1000 years. “I’ve observed that many of the problems we face are our own creation. We are afflicted by anger, hatred, jealousy and suspicion and yet modern education has little to offer in terms of achieving peace of mind. It is oriented towards material goals. Wherever I go I draw attention to the inadequacy of modern education and its failure to foster inner values. I point out that just as we teach about physical hygiene, we also need to cultivate emotional hygiene, since as well as being physically fit, we need to be mentally fit too. “The ancient Indian practices for cultivating a calmly abiding mind (shamatha) and insight (vipashyana) gave rise to a deep and subtle understanding of the workings of the mind. In addition, ancient Indian knowledge encouraged compassion and non-violence (karuna and ahimsa). These are the basis of India’s remarkable sense of religious pluralism, with many religious traditions living together in harmony—demonstrating vividly that it is possible to do so. “The purpose of our lives is to be happy. We constantly live in hope. Pleasure based on sensory experience is short-lived, whereas the ultimate source of lasting happiness is in the mind. “Although accounts of this and ways to tackle our destructive emotions are laid out in Buddhist texts, there is no reason why we can’t extract that knowledge and examine it in a secular academic way. Methods for tackling our destructive emotions are very relevant in today’s world. They don’t involve temples, rituals or prayers, but a rational education on a secular basis. In his replies to questions from the audience His Holiness agreed that being well-off does not guarantee you’ll be happy. He mentioned an American Vice-Chancellor who was well paid and had a good reputation and yet stress and anxiety left him unhappy. By way of contrast His Holiness mentioned a Christian monk he met in Spain who had spent five years in seclusion as a hermit meditating on love. He had only the most basic facilities and yet the sparkle in his eyes revealed his experience of genuine happiness. Finally, asked what enlightenment is and how to achieve it, His Holiness clarified that it is accomplished less by prayer than by training the mind. By study and contemplation day by day it’s possible to overcome ignorance. Combining that with altruism, it’s possible to make a start on the path to enlightenment. As the event came to a close, His Holiness was presented with a portrait executed by an art teacher. He offered auspicious emblems and white scarves to the Chief Minister and Deputy Chief Minister. Following a vote of thanks by the Education Secretary, everyone stood for the national anthem. His Holiness then enjoyed lunch with the Chief Minister and members of his cabinet, after which Chief Minister Kejriwal and Dy CM Sisodia walked with him to his car to see him off. 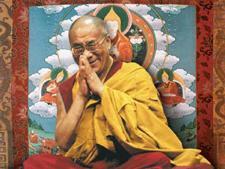 Tomorrow, His Holiness will fly to Ladakh.